stress x area above N.A. stress x area below N.A. In the fully plastic condition, therefore, when the stress is equal throughout the section, the above equation reduces to y) areas above N.A. = ^ areas below N.A. Fig. 3.7. 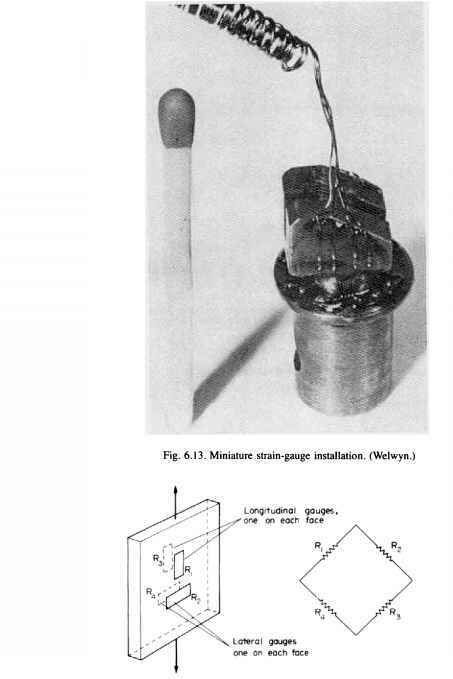 Partially plastic bending of unsymmetrical section beam. and this is an equation in terms of a single unknown y , which can then be determined, as can the independent values of F\, Fi, Ft, and F4. The sum of the moments of these forces about the N.A. then yields the value of the partially plastic moment Mpp. Example 3.2 describes the procedure in detail. Whereas with symmetrical sections the position of the N.A. remains constant as the axis of symmetry through the centroid, in the case of unsymmetrical sections additional work is required to take account of the movement of the N.A. position. However, having determined the position of the N.A. in the fully plastic condition using eqn. (3.6) or (3.7), the procedure outlined in §3.2 can then be followed to evaluate shape factors of unsymmetrical sections - see Example 3.2. Deflections of partially plastic beams are normally calculated on the assumption that the yielded areas, having yielded, offer no resistance to bending. Deflections are calculated therefore on the basis of the elastic core only, i.e. by application of simple bending theory and/or the standard deflection equations of Chapter 5^ to the elastic material only. Because the second moment of area I of the central core is proportional to the fourth power of d, and I appears in the denominator of deflection formulae, deflections increase rapidly as d approaches zero, i.e. as full plasticity is approached. If an experiment is carried out to measure the deflection of beams as loading, and hence B.M., is increased, the deflection graph for simply supported end conditions will appear as shown in Fig. 3.8. Whilst the beam is elastic the graph remains linear. The initiation of yielding in the outer fibres of the beam is indicated by a slight change in slope, and when plastic penetration approaches the centre of the section deflections increase rapidly for very small increases in load. For rectangular sections the ratio MFP/ME will be 1.5 as determined theoretically above. Fig. 3.8. 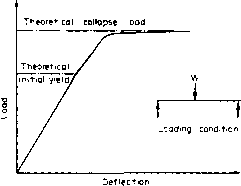 Typical load-deflection curve for plastic bending.